It’s another damn Monday. Let’s do another show tune, eh? …for half-price on the day of the performance. Clearly, the environment that had allowed this show to close early is populated by idiots because it was fantastic. The staging was creative and engaging and the whole experience underscored why I love live theater, and how deeply I wish I could see more shows. Here’s an example. 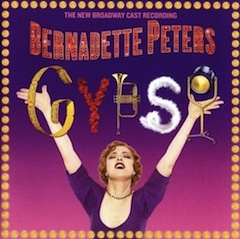 “Gypsy” follows Gypsy Rose Lee’s path through show business, from her beginnings as a child vaudeville performer to mainstream stardom as a burlesque performer. The real star of the show is Mama Rose. Denied acknowledgement of her own talent and potential, she drags her two daughters into show business just to prove to the world how wrong everybody was to deny Mama her rightful place in the spotlight. The conceit of the show’s design was that the physical sets got bigger as the show progressed. At the very end of the show, when Gypsy’s a huge star, she strips on a glitzy stage set that fills the whole dimensions of the Schubert Theater’s actual stage. But the first time we see her perform as a little girl alongside her sister, it’s on a fake theater stage about two thirds that size, with its own proscenium arch. The rest of the Schubert stage is bare, all the way to the back wall. Early in the show, we get to see the little girls’ whole stage act from start to finish. Meanwhile, you can see Mama Rose in the wings, through ambient lighting. She has no lines and no “business.” In fact, it’s not even set up to look like the wings of a stage. She’s just sort of stranded out there in Twilight Zone space after she makes her exit. You’re sort of wondering why Bernadette Peters even has to bother standing there when she could be relaxing offstage for five minutes. Ah: but in the middle of the girls’ performance, one of the two little girls has a costume change. The girl dances off of the fake stage into the wings, where Mama Rose helps her do a quick-change in time for her re-entrance after the other girl’s solo. Again, there’s no special lighting, dialogue, or business. The audience’s attention is clearly supposed to be on the solo performance taking place on the mini-stage. You see what I’m getting at? The director had this great idea of having the fake theaters get larger as the show progresses. But at some point in the planning, everyone’s faced with the fact that this real girl needs to do a real costume change…only now, she really has nowhere to go to do it. There’s only one way out of the problem. Bernadette Peters, one of Broadway’s biggest stars, who’s being paid a hell of a lot of money, has to act as this little girl’s dresser. Sure, that makes sense from a dramatic point of view. Mama Rose would be standing just offstage, and she would be helping her kids change. But I’m certain that in six to eight performances a week, during those thirty seconds, Peters wasn’t playing the role of Mama Rose. It was way, way more important that she be a damned good dresser and made sure that a fellow castmember was in full costume by her next cue. The second act is full of big, showstopping numbers. This is one of them. At this point, Mama Rose’s tyrannical obsession with success has driven away one of her two daughters and the manager who was this close to becoming Mama’s husband and allowing Mama and Gypsy to finally have normal lives. Now it’s driven her to this: she’s pushed her youngest daughter into stripping in burlesque. A few established — I suppose the adjective “weatherbeaten” wouldn’t be a stretch — pros help the newly-christened Gypsy Rose get ready for her first strip. In a powerful scene that acts as the obvious emotional and dramatic center of the show, three wise women teach the young Gypsy Rose Lee everything she needs to know about dancing…and, about life; Gypsy leaves their tutelage with all of the tools she needs to finally assert herself and rise above the minor supporting castmember who plays her insane and domineering mother. The theater is a bit like baseball, or at least Al Capone’s description of it. Yes, you’re out there playing as a team, but for most of the players theres also an opportunity for individual accomplishment. I do like the fact that for a full four minutes and fifty seconds, not including ovations, the entire show is about these three women. And boy, do they perform the song that way. If you own a +10 Sword of Dispersement of Broadway Magic, “You Gotta Get A Gimmick” still holds valuable lessons. It’s pretty much everything you need to know about successful Internet marketing. “A blog about serialized graphical storytelling” won’t get much traction. But if you tell me “I make fun of ‘Mary Worth’ and other comic strips several times a week” within a few days, I’ll be buying tee shirts from your online store. Listen to “You Gotta Get A Gimmick” on the Amazon MP3 Store. My own gimmick is to somehow bamboozle you into clicking an Amazon Associates link, so that I can get a small kickback from all of your Amazon purchases. Because paying to have my own personal and private bouncy-house in my office would just be silly.